Considerably ahead of the curve in taking on the character and meaning and consequences of torture as a fruitless and brutal human rights abuse...shows The Next Generation operating at the top of its game. 86 min. Paramount Television. Directors: Robert Scheerer, Les Landau. Cast: Patrick Stewart, Jonathan Frakes, David Warner, Ronny Cox, Brent Spiner, Levar Burton, Marina Sirtis, Michael Dorn, Gates McFadden. Back in 1992, torture was certainly a relevant issue, but it hadn't yet come into the American cultural spotlight as much as it would beginning with the 2004 revelations about techniques used at Guantanamo Bay. In that respect, Star Trek: The Next Generation's two-part episode "Chain of Command" was considerably ahead of the curve in taking on the character and meaning and consequences of torture as a fruitless and brutal human rights abuse. 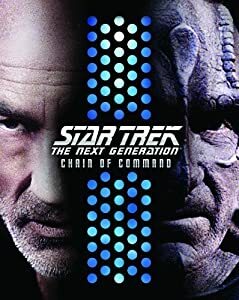 Captain Picard (Patrick Stewart, whose involvement in Amnesty International helped to spur the episode) gets a highly risky Starfleet Command assignment to take a small team (himself, Worf, and Crusher), sneak into a secret Cardassian biological weapons installation, and destroy it. The mission goes awry, and Picard finds himself the captive of a sadistic Cardassian interrogator named Gul Madred (David Warner of Star Trek V, Time Bandits—oh, and the Royal Shakespeare Company). Meanwhile, the Enterprise needs a new captain in the perhaps permanent absence of Captain Picard, and so Captain Edward Jellico (Ronny Cox of Deliverance and Robocop) arrives with his own no-nonsense approach to getting the job done, rattling the crew in the process. The Jellico storyline seems expressly designed to make a meal of what's undoubtedly The Next Generation's biggest bugaboo: creator Gene Roddenberry's insistence on a total lack of conflict within the ranks of Starfleet. This post-Roddenberry episode tells fans to strap in and forget all that, diving in with Jellico's top-down overhaul to ship efficiency enraging Riker (to whom Jellico takes an instant hate) and particularly disconcerting Troi and Geordi. Another conspicuous strength of the two-parter is its thorough incorporation of all of the regulars into one storyline for an unusually broad use of the cast. "Chain of Command" shows The Next Generation operating at the top of its game. For technical specs, see my review of Star Trek: The Next Generation—Season Six. This single-disc Blu-ray release includes the two-part episode seamlessly merged into a single feature-length experience, presented in HD video and audio. Bonus features kick off with an audio commentary by Ronny Cox, director of photography Jonathan West, and Star Trek experts Mike and Denise Okuda covering the story, characters, and production of the episode. The all-new documentary "The Privilege of Rank: Making 'Chain of Command'" (28:35, HD) includes reminiscences by Cox, Stewart, Sirtis, Natalia Nogulich, supervising producer Frank Abatemarco, and writer Ronald D.Moore. The doc gets into the story's themes, inspired by the involvement of cast and crew (particularly Stewart) in the work of Amnesty International, the casting of David Warner (an idol and former colleague of Stewart's), and a variety of observations about the production and the resulting hour of television. Rounding out the disc are nine interesting trims—"Deleted Scene, Part 1" (1:49, HD) and "Deleted Scenes, Part 2" (11:40, HD)—and "Episodic Promo, Part 1" (:34, SD) and "Episodic Promo, Part 2" (:34, SD). All site content © 2000-2019 Peter Canavese. Page generated at 04/25/2019 02:43:27PM.